Welcome to The Abso!ute Sound online! We explore music and the reproduction of music in the home. We believe that the sound of music, unamplified, occurring in a real space is a philosophic absolute against which we may judge the performance of devices designed to reproduce music. Our goal is to provide the resources consumers need to judge how a component's sound either honors or departs from the music's truth, and to make sound purchasing decisions that maximize their experience of reproduced sound. 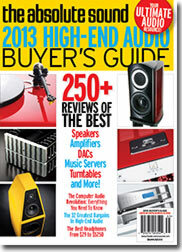 Below is our Issue 227, 2013 High-End Audio Buyer's Guide table of contents and link to the editorial. 8 From The Editor: What makes an audio component "high-end" rather than "mass-market?" Robert Harley reflects on this question — and on why high-end doesn't have to mean high-priced. 10 A New On-line Home for The Absolute Sound: Take a guided tour of our terrific new Web site, TheAbsoluteSound.com. 40 Music Feature: Personal Faves Lists: Our writers pick their ten favorite recordings in a slew of different genres and sub-genres. We pick some of the most spectacular values in high-end audio today.